The Pratt Beavers are officially the Seward County Saints Kryptonite. The red hot Saints took their home floor against a Beaver team with just one win over an NJCAA opponent in the past three weeks on Saturday night in the Greenhouse but had no answer for their potent attack. 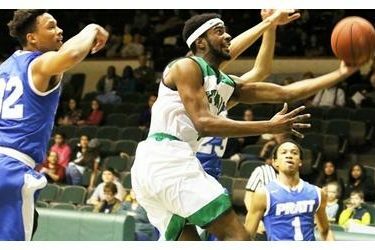 Pratt finished the game shooting 67% from the three point line and used 33 second half free throw attempts to put away Seward 104-94 late despite a 36 point effort from Niem Stevenson and a 27 point night from Charles Beauregard for the Saints. Pratt started hot and the Saints were never able to slow them down. The Beavers scored 10 points in the first four minutes of the contest and despite six early points from Niem Stevenson, the Saints were in the trail position, down 10-6. Pratt used a barrage of threes to open their lead to 21-12 moments later and stretched it to a double digit lead at 31-21 with 8:50 to go in the half. Charles Beauregard tried to give Seward a lift, scoring eight straight for the Saints including back to back three pointers at one point, to cut the Beaver lead in half at 34-29. It remained a five point game with 3:35 to go in the period, but the Beavers put their foot firmly on the accelerator before the halftime buzzer, outscoring Seward 12-1 to close out the half and storm into the locker room at the break up 53-37. The Beavers lit the nets up for 67% shooting in the first half and cashed in on 8 of 11 three point attempts to grab the big lead. Seward got 20 first half points from Stevenson and 11 from Beauregard while the rest of the Saints lineup managed just 6 combined points. Seward got the first four points out of the half, but the Beavers remained red hot shooting the basketball, nailing back to back threes to push their lead all the way to 18 at 59-41 in the opening minutes of the second half. The Saints jumped on Stevenson’s back for the next three minutes as they whittled the Beaver lead back to single digits, but their good fortunes didn’t last long as Pratt scored the next five and just like that Seward was back down 14 with 12:51 to go. Seward never recovered from that Pratt push as the closest they would get for the final 10 minutes of the game was 10, watching the Beavers march back and forth to the free throw line down the stretch before the final horn sounded in a 104-94 win for the visitors. After having six players reach double figures in their win Wednesday over Butler, the Saints saw just two do the trick Saturday against the Beavers. Stevenson tied a career high with 36 points in the loss and recorded his third double-double of the year with 10 rebounds. Beauregard poured in 27 on 10 of 19 shooting in the game. Pratt finished the game an unbelievable 67% from the three point line in the game, going 12 for 18 while shooting 54% overall from the field. The win for Pratt is its fourth straight against the Saints as Seward’s drought of victories against the Beavers continues to run all the way back to February of 2014. Seward falls to 13-2 on the year and 3-1 in Jayhawk Conference play while the Beavers improve to 9-5 overall and 2-1 in conference action. Seward will have to wait a while to relieve the sting from Saturday’s loss as they won’t take the court again for 21 days when they travel to Independence to start the second semester of action against the Pirates.